Brakes on cars, trucks, buses, vans, and RVs are increasingly becoming more complex systems. Some vehicles have electric-assist brake calipers that engage when the car senses rain, and most vehicles have a detailed ABS system that adds multiple sensors, solenoids, a control module and an abs pump. There are many parts to brake systems including brake pads, brake shoes, rotors, drums, wheel cylinders, master cylinders, and brake boosters. At Grimm’s Automovation, our ASE certified brake specialists offer years of experience in brake maintenance, repair, and replacement for all makes and models of vehicles, including heavy duty trucks. Stop in to Grimm’s today for trusted brake repair and service. 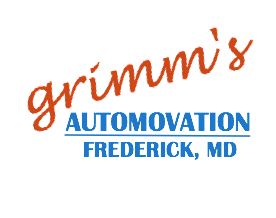 Grimm’s auto and truck repair shop is conveniently located on N. East Street in Downtown Frederick, MD. We offer complete repair services including brake repair and replacement for all of Frederick County, MD and surrounding areas including: Middletown, Thurmont, Brunswick, Urbana, Libertytown, New Market, Mt. Airy, Myersville, Adamstown, Buckeystown, and Urbana.